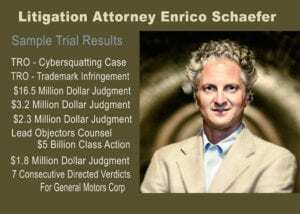 Mr. Schaefer is a seasoned trial attorney practicing internet, copyright, domain name, social media, copyright, trademark, consumer class action and mass tort law on a global basis. Mr. Schaefer has significant experience in internet and technology company representation, having been named President and General Counsel of an internet start-up company in Boulder, Colorado. Mr. Schaefer has been retained on domain valuation issues in divorces, business asset valuation and other matters, having developed domain name valuation methodologies for use by courts, judges and juries. Mr. Schaefer understands the issues facing technology companies and brick-and-mortar companies with technology and internet issues. He is a software developer and technologist. Mr. Schaefer represents domain name registries, registrars, internet service providers, web hosting companies, social media influencers, brand owners, web developers, e-commerce providers, affiliate marketers and many others in the technology space across a wide range of issues. Mr. Schaefer has first chair trial experience in a wide variety of litigation matters, including consumer internet class action litigation, mass accident, cybersquatting actions, intellectual property, commercial and fiduciary litigation, UDRP and IP licensing. He has represented some of the largest companies in the world in litigation, domain name, trademark and related matters. He has multiple million dollar plus verdicts to his name. He is a frequent author and presenter on issues related to protecting business interests in a global internet economy. Mr. Schaefer represents personal, company and business interests from around the world. He has acted as a domain valuation expert in numerous proceedings, valuing 10s of million of dollars of domains with, and without, website traffic. Traverse City, MI, January 2005 – present. Law firm focused on global protection of business interests, mass tort litigation and class actions. Specializing in drone and UAS la, internet law, intellectual property issues, domain disputes, complex litigation, technology company representation and general counsel services. using technology to connect to clients located throughout the world. Traverse City, MI, January 2000 – December 2004.
Business and internet law, first-amendment and defamation, commercial transactions, non-compete contracts, trade secret theft and commercial matters. Leland, MI, May 1995 – present. Business, commercial and intellectual property representation and litigation. Firm was founded specifically to pursue the case Overlooked Opinions, Inc. v. TransNational Communications, Inc. in the Federal District Court for the District of Massachusetts. Case involved breach of contract, unfair trade practices, intellectual property rights violations, FCC regulatory issues, insurance coverage disputes and UCC Article 9 security and collection issues. Also handled a variety of commercial and transactional work for telecommunications clients, including loans, financing and vendor-supplier contracts. The jury returned a $2.4 million dollar verdict in favor of Mr. Schaefer’s client. Birmingham, MI, January 1999 – 2000. Litigation firm specializing in national product liability and commercial litigation. Handled complex litigation on a project basis in cases pending throughout the United States. President and General Counsel, All-One Intranet, Inc.
Boulder, CO, October 1996 – June 1998. Internet technology company located in Boulder, CO. Provided representation and managed outside counsel in a variety of corporate, finance and commercial contract issues, including: corporate structure; venture capital financing; reseller and strategic partner contracts; merger strategies and vendor relations. Detroit, MI, September 1993 – January 1995. Admiralty & maritime law firm focusing on complex toxic tort litigation and mass tort class action on behalf of merchant mariners. Toxins included asbestos and benzene. Front-line involvement with mass tort class action proceedings, federal MDL litigation, bankruptcy proceeding against insolvent ship owners and insurance (P & I) coverage disputes. Detroit, MI, July 1991- September 1993. Automotive product liability and toxic tort defense litigation. Represented automotive manufacturers and large insurance carriers in complex product liability litigation on a national basis. Handled all aspects of litigation, from case strategy and pre-suit investigation through discovery and trial. Recipient, American Jurisprudence Awards: Contracts, Civil Procedure, Constitutional Law, Corporations, Evidence, Estates and Trusts and Research Writing and Advocacy. Managing Editor, Detroit College of Law Review, 1989. Author: Case Note Publication, “Barring the Tort Claims of Fire Fighters and Police Officers,” Detroit College of Law Review, Issue 3, Summer 1988.